Overview : Chhattisgarh is always remained as the goldmine of the raw beauty of nature and the fascinating tribal culture. And Bastar, the heart of Chhattisgarh, for being blessed with all these exceptional delights, despite being far from the reach of common people, is always considered to be at the top of the must go list of all photolovers. 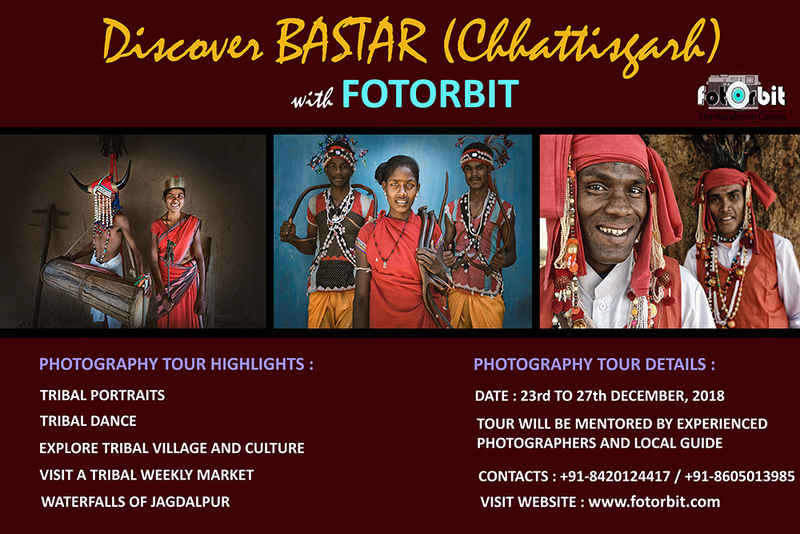 So we have designed our Bastar photo-tour specially to make use of the best of photographic opportunities here with the extended help of distinguished local people photographically concerned to the places. 23rd of December, 2018 (Sunday) : Arrive Raipur by 12.00 noon ( either by flight or train). Accordingly we will pick you up and leave for Jagdalpur. Jagdalpur is 5 hours drive from Raipur. En-route we will have our lunch. On arrival, check-in to the hotel and get fresh. Before dinner we will have a brief introduction session. 24th of December, 2018 (Monday) : Our early morning shoot will start with the famous Chitrakoot Falls which is well-known as the ‘Niagara Falls of India’. After lunch visit weekly tribal market or “Haat” to observe and shoot a part of tribal life. Back to hotel by late evening and we will have a review and discussion session of the day. 25th of December, 2018 (Tuesday) : After breakfast, start for a Tribal Village for Muria tribal dance and portrait shoot. After lunch visit another tribal village which is famous for Dhokra Metal Handcrafts. Bastar is famous for its metal art works. Experience and shoot the dokra handicrafts making process. Getting back to hotel, we will have a photo review and discuss session of the day. 26th of December, 2018 (Wednesday) : After breakfast we will start for Bison Horn Maria tribal village , to witness their unique dance and portrait shoot. This particular tribal community of Chhattisgarh is famous for wearing a distinctive head-gear, which resembles the horns of a wild bison. FOTORBIT will organise a dance program with these tribal group and arrange a portrait shoot session. After lunch we will visit some tribal villages to experience and shoot village life of rural Bastar. Returning back to hotel, we will have a photo review and discussion session of the day. 27th of December, 2018 (Thursday) : After breakfast, we will start for Raipur. On the way will have our lunch and get dropped to either airport or Raipur Junction for our onwards journey…Get back home with some unique experience and photographs. Shared double bed room (with same gender participant) in a standard clean hotel at Jagdalpur, with western toilet. For separate room extra charge is applicable. It will cover your main meals (breakfast, lunch and dinner), starting from 23rd December, 2018 lunch to 27th December, 2018 lunch. All local transports related with our photo tour in A.C Tempo Traveller i.e. Jagdalpur town to various interior places of Bastar. Train/flight tickets to and from Raipur. Any additional food items or beverage during meals. Any extra mineral water bottle / beverage will be our personal expense. FOTORBIT does not have any insurance policy covering the expenses for accident, sickness, loss due to theft, or any other reasons. All baggages, camera, other gears & personal property/s at all times are at the client’s risk.